So this year it's all about Monty the Penguin. It's a very sweet and awww kind of advert. This little boy and his Penguin always play together and have lots of fun together. They are best friends but then Monty sees two people holding hands in the park so Monty gets sad, and now all Monty wants is a girlfriend. So the little boy gets him his girlfriend, then the shot goes to two teddy bear Penguins, as it was all the boy's imagination. I do like the advert this year but the boy was using his imagination on his toy so the boy's imagination must have been based on finding a friend for himself, and thinking that mad me a little bit sad. But that may be me looking into things too much. 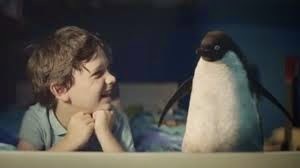 John Lewis has hit the jackpot this year with this as Monty has his own hashtag on twitter as well as all the thing that are on sale for him and his lady Penguin (I just found her name out and she is called Mabel). They sell Face Cloths for £3.50, Cushions for £15 and Large Toys for £35 to Girls' Jumpers at £14 and most things in between. By the sound of it they are selling fast, even on ebay now for a Monty Teddy Bear at £53.00 and still going up. It's crazy but all I have to say is well done John Lewis as it has got people into their stores and when it comes down to it that's what they want. I want to see John Lewis do a fun advert soon as all of them for the past few years have tugged at the heart strings. they really do know how to make a good Christmas ad, Monty is super cute. We actually saw this for the first time last night, I loved the ending was so cute.